The Summer Olympics start this week. But that’s not the number one reason why I made these Greek-inspired recipes. I woke up Monday morning and thought I’d try doing a Whole30 (basically, a month-long clean eating and drinking program). But considering it was the first of the month when I made this decision – and most importantly, I wasn’t prepared – I thought I’d do a Whole15 instead. So I came to the conclusion that instead of Whole30, Whole15, or even Whole5 I just wasn’t going to eat crap – for the majority of the week at least. 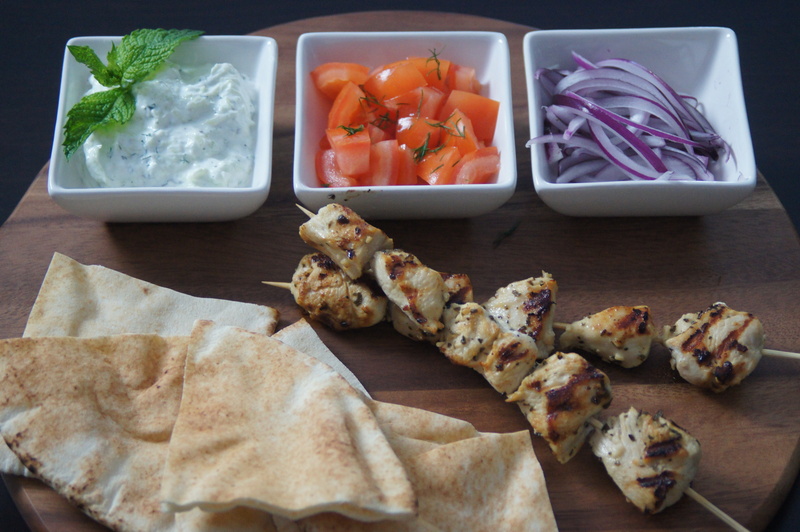 I think subliminally I decided to look up the recipes for chicken souvlaki and tzatziki, which I used to make frequently about 4 or 5 years ago, because of the upcoming Summer Olympics. I say subliminally because I have on constant repeat in my head the Today show’s Olympic trumpet theme. It’s like a non-stop ringing in my ears. Also, I caught this month’s episode of HBO’s REAL Sports with Bryant Gumbel, which was an hour-long investigation into how messed up and corrupt the International Olympic Committe is. It almost makes me not want to tune into the Olympics this time around. But the athletes worked so hard and they’re always so inspiring. Plus, I don’t think it’s fair to blame the athletes for something they didn’t do and aren’t responsible for. Guilt-by-association isn’t fair here…or anywhere, for that matter. But if you can, check out REAL Sports with Bryant Gumbel this month. It’s really eye opening. Oh yeah, and another reason I can’t not watch the Olympics: Ryan Lochte. Enough said. Regardless of my ear worm and lack of love for the IOC, the chicken souvlaki and tzatziki go well with my Whole-Or-Nothing diet/non-diet theme. I loves me some chicken, especially when its been marinating in fresh lemon juice, olive oil, and garlic overnight. And there’s no sugar in the souvlaki or any unpronounceable ingredients – and that’s always a good thing. I wanted to make the tzatziki, not only because it’s delicious and goes well with the souvlaki, but because it makes me think of the old Steve’s Greek Cuisine on Newbury St. in Boston. Sadly, Steve’s on Newbury closed a couple of years ago, but I heard that it’s still alive and kicking in Faneuil Hall. I’m sure the food is still good, but if you went to Steve’s, especially in the 80s, 90s, and even early 2000s, it might not be the same experience. Maybe I’m being biased because The Back Bay is my absolute favorite part of Boston. I used to love “hiking” all the way to Newbury and Hereford St. for the best avgolemono soup in the city and the most garlicky tzatziki I’ve ever had. The tzatziki I made here isn’t nearly as garlicky, but I did add two cloves of garlic instead of one. I know, what a rebel. 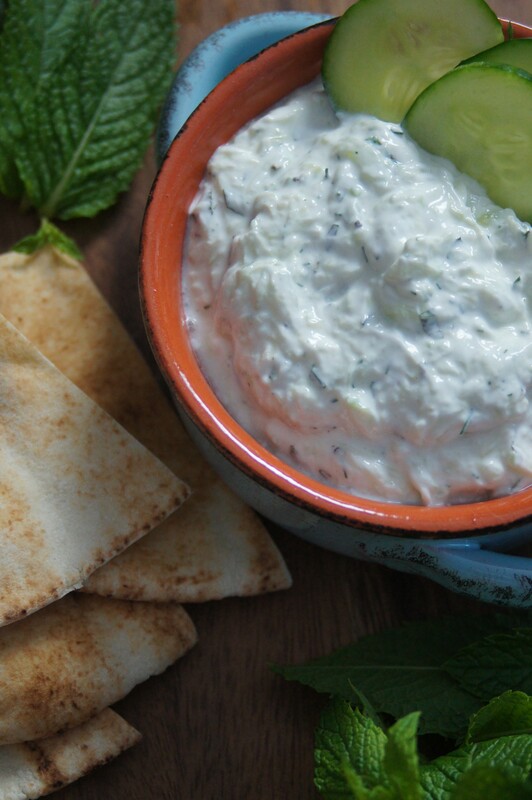 Tzatziki also goes well on top of a burger and with toasted pita or slices of cucumber for a snack. And of course, it goes well with rosé too. *shred English cucumber with a box grater and place in a colander. Sprinkle salt on top of shredded English cucumber and let sit for about 20 minutes. Put drained and shredded cucumber in a dish towel or cheesecloth and squeeze out any remaining liquid. Set aside in a bowl. Whisk all the marinade ingredients in a bowl and set aside. Place about 5 or 6 pieces of chicken on each skewer and place in a shallow pan or dish. 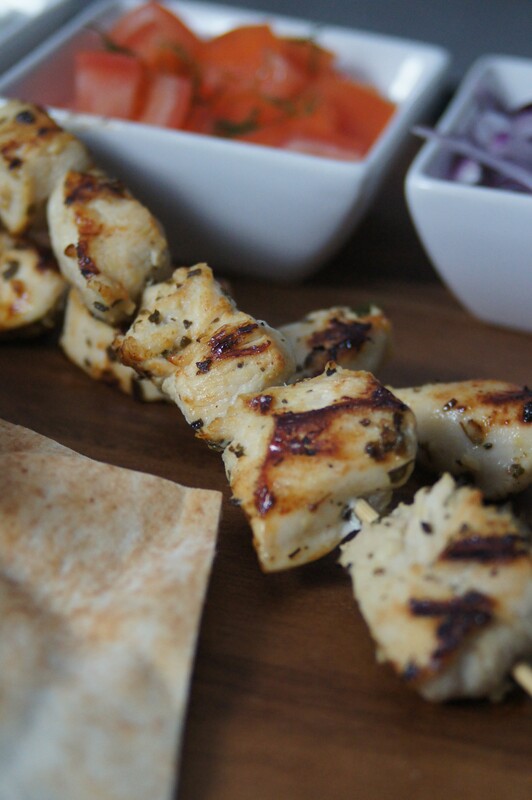 Pour marinade evenly over all of the souvlaki and let marinate overnight or at least a few hours, turning once. Prepare a gas or indoor grill. Depending on the thickness and size of your chicken, cook evenly on both sides until cooked and juices run clear. Combine all ingredients in a bowl. Cover and refrigerate overnight before serving.